"I hosted Court in the Act for my 18th birthday party last year and it went amazingly well. We all dressed in costume – to varying degrees – and it was a great icebreaker for people who didn't know each other well or at all. Everyone's character allowed for so much interaction. "At the end we gave prizes – bags of Ye Olde English chocolate coins – for various categories. These included best dressed, best speech, best deceit, best acting, best characterisation, and of course, the best death scene – we accidentally killed Shakespeare. Oops. "Anyway, it was a great success and everyone loved it – even the people who were most apprehensive at the beginning. One of the people there has just called me to find out your site – they're going to do one for their birthday too!" "I hosted Court in the Act for my 18th birthday party, and it went down a storm. I was initially apprehensive that a large group of teenagers used to discos and the like might find the idea a little silly and geekish, and not want to get involved, but I couldn't have been more wrong. I have never seen some of my friends as excited as they were when they opened their invitations. I'll admit that I ended up having to play around with the storylines a little – some of the characters weren't quite as gender-neutral as they were supposed to be, and I had an excess of girls, but this actually proved useful as I could tailor the event to the guests I had. I also wrote an extra, purposely non-taxing, character for a particularly shy guest, who by the end of the night got so into it that he was awarded a prize for the Most Outrageous Death! I had so many compliments for coming up with a unique way to celebrate my 18th that it was unreal. Even my college teachers were jealous that they couldn't come! I would definitely recommend this kind of party to others – they are great fun to host, and they get everyone involved. Inhibitions usually disappear within half an hour, and it's great if you have friends that don't all know each other very well, as I do. Thank you very, very much for a wonderful evening. I hope to run another night like this one very soon." "I decided to have a murder mystery party for my 18th birthday. I chose Court in the Act because I'm really into the Renaissance era. I'm so glad I came across Freeform Games! My guests had so much fun – they said it was the best party they've ever been to!! Everyone dressed up (especially my Queen Elizabeth!) At first, everyone had a hard time starting out, but after an hour, everyone was talking to each other. Not all of my friends knew each other, but the party was a success nonetheless! We served Maggiano's Little Italy catering instead of English food, which was a bit odd… haha! But that didn't stop my friends from acting all "English". Overall, the party was a huge success!! THANK YOU, FREEFORM GAMES!!!" "We've played roughly 10 of your games, and Court in the Act was one of the best. We like it when there's something unique and memorable about the game, like resolving the Spanish invasion at the end. And plenty of opportunity for dressing up!" "I bought this game to play with my Shakespeare class (the students were 12–18) – it was a very fancy affair. We just did it today. It was AWESOME. Everyone came in costume and had a blast. They were begging me to do it again!" Court in the Act is a dinner party murder mystery game for 13 to 21 guests and one or two hosts – download the free introductory pdf file. Join us at the court of Queen Elizabeth I of England for an evening of revelry, intrigue and murder. You will be in the middle of the action and it will be up to you to wheel and deal with the other guests. Can you achieve your goals, keep your secrets hidden and survive Court in the Act? It's up to you. The Court of St James's Palace, London, in the reign of Queen Elizabeth I. All present have but lately arrived from the Royal premier of Master Shakespeare's latest rib-tickling comedy, Two Ladies of Venice. Now, the Queen makes merry and entertains her courtiers, guests, would-be husbands and envoys from foreign powers with a sumptuous banquet. But while all prepare to feast and frolic, dark clouds gather, the sound of war-drums is heard in the distance - and that dear old man the Archbishop of Canterbury, who surely had never an enemy in the world, is found brutally murdered. Who murdered the Archbishop of Canterbury? Why must Queen Elizabeth never marry? What is the secret of Dr John Dee's magical powers? ...and can England be saved from defeat by the Spanish Armada? Find out in Court in the Act! Court in the Act lasts for about four hours and is suited to an evening. It is often played over a meal – a finger buffet if possible to allow guests to circulate and talk in private. "I use Court in the Act with students who are not able to go on our 8th grade Washington D.C. Trip. We have played it for three years now, and each year is different but amazing. The kids get involved and do a great job. They love being able to participate in something special that other kids don't do! Plus it ties in to our reading of "Much Ado about Nothing". Thanks for the great product! " The free introductory pdf file contains an introduction to the game, a cast list of all the characters, and a copy of the Prologue – plus details of how to buy the game. Court in the Act is unlike many murder mystery games. Although the game starts with a murder, most of the characters have more important things to do than to investigate it. And the killing may not be over – it is unlikely that everyone will survive the remainder of the evening! Court in the Act is played just like a murder mystery game. You may be trying to solve the murder, but primarily you are (initially at least) concentrating on your own goals and objectives. 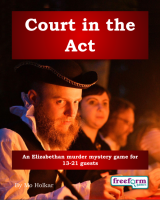 Unlike most boxed murder mystery games, Court in the Act lets you decide how to achieve your goals and thwart your enemies. "Court in the Act was amazing! We made so much food but everyone forgot to eat because they were so in to the game. We used our balcony for "private conversations". Very few of my guests had played a murder mystery game before but the ones who had agreed that this was a way better, more interactive set up." On the evening of the game the guests are met by the organizer, the Chamberlain of the Court of St James. They then receive their detailed backgrounds - including dark secrets, objectives and money. When everyone has arrived the Chamberlain announces that, despite the recent tragic events, dinner will now be served. The fun then begins as everyone questions, bribes and blackmails each other. As the evening progresses they may even try to murder one another! Depending on what the players choose to do, there are several different possible endings, but finally everyone finds out how they did, and what secrets everyone else was concealing. Court in the Act costs £25.00 (GB pounds) or US $39.99. You can buy it in either currency, from anywhere in the world, as you prefer. The price will be converted back into your own currency for you, at today's exchange rate. We offer a Cast Iron Guarantee on all our murder mystery games. If you're not completely satisfied with Court in the Act then please let us know within 30 days and we will refund you. See our full terms and conditions here.